Beacon is the farthest northeasterly town in the Wheatbelt. 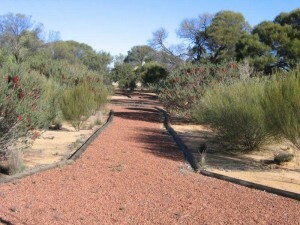 It is on the border of the farming area, bushland and pastoral country. There are numerous rock formations, many of which have been harnessed for the collection of rainwater. The Beacon Botanical Park was established in 1999 and is adjacent the Primary School. The Beacon Men’s Shed. Call in for a chat. Billiburning Rock Surveyed by Harry Sanford King around 1889 – 90, Billiburning Rock is situated in the North-East of the Shire near the vermin proof fence. 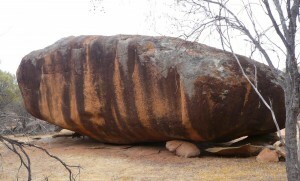 This rock is part of quite a large natural forest reserve, a relatively undisturbed bushland area, it is one of the largest outcrops in the area and provides many opportunities for birdwatchers. It has attractive wildflowers and native fauna can often be seen. A good view from the top of the rock to appreciate the beautiful sunsets offering many photographic opportunities. As the rock is quite close to the Vermin proof fence you often have good sightings of wedge-tailed Eagles, Budgerigars, Black Cockatoos, Purple-crowned Lorikeets, Major Mitchells and Mallee Fowl. The area surrounding the rock is a good picnic and camp area. To get to the rock, take Ingleton Rd north from the Beacon townsite for 30km to White Road and Huckstep Road, travel north on White Road for another 3km to the rock entrance on your left. There are no services at the rock. Please take your rubbish with you. Van access. east of Beacon, an area opened to pastoral leases as far north as Datjoin in 1872 and the well was dug in early 1900’s by sandalwood cutters. During the winter and spring months of July to October Datjoin Reserve is a popular picnic and tourist camp spot for travellers as well as those looking to find some of the best orchids and wildflowers the region has to offer. Beacon locals also frequent the area, having enjoyed many years of picnicking and socialising in years past at Datjoin. Tampu Well is an old Government well that was used by sandalwood prospectors and shepherds. Nearby is Beagley’s Breakaway. Mouroubra Rd to Paynes Find offers an alternative unsealed route to and from Perth and other south west towns to Mt Magnet and the North West. Check with Beacon Community Resource Centre for road conditions. The Vermin Proof fence was constructed in the late 1950’s. The fence was constructed to keep out the emus and wild dogs from farming areas. Crimpy’s Tank, built in 1966, is a rock catchment tank with a standpipe. Opening Times: CLOSED UNTIL FURTHER NOTICE. Opening Times: Monday 5pm to 9pm; Tuesday to Friday 5pm to 11pm; Saturday 12pm to 2pm and 5pm to 12am; Sunday 11.30am to 1.30pm and 4.30pm to 8.30pm. Meals Available on Thursday & Saturday nights. Frozen takeaway foods available every day. Opening Times: Weekdays 8.30am to 5pm; Saturday 8.30am to 12pm (April to Sept 8am to 11am). Eftpos available. No auto gas available.